DBL Sharks Sheffield captain Mike Tuck has said he is ‘proud’ and ‘excited’ to have been selected to represent England at the 2018 Gold Coast Commonwealth Games. It has been announced that Tuck, who along with his Sharks team mates has been preparing for Sunday’s trip north to face Glasgow Rocks, has made the final 12-man squad for the forthcoming Games, and will travel out to join the England set-up soon. “It’s very exciting,” said Tuck. “I’m looking forward to setting off. This will be my first time in an international competition with England and it’s going to be amazing. Meanwhile, Tuck is looking forward to locking horns with fellow British Basketball League Championship top-four contenders Glasgow Rocks this weekend. 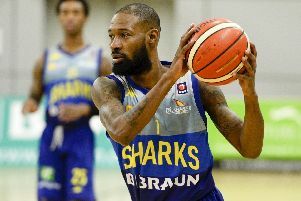 The Sharks bounced back from their BBL Trophy final heartbreak with an impressive win over Cheshire Pheonix last weekend and have the opportunity to put any lasting frustration following the Trophy final loss behind them when they travel north of the border once again on Sunday. It was at Glasgow’s Emirates Arena two weeks ago that the Sharks fell to an agonising 90-85 defeat to Leicester Riders and face another tough test against the Rocks this time out. Tuck said: “Everyone’s feeling good and everyone’s healthy – last time we were up there we walked away frustrated. But we’re going up there playing a different team and go into it off the back of a win. “We’ve beaten them [Glasgow] once already this season so we’re looking to get the head-to-head over them, as they’re going to be one of those teams that potentially we will be battling with for seeding in the play-offs. Sharks captain Tuck also turned scout a couple of days after that Cheshire win when covering Pheonix’s road defeat to Glasgow for Freesports UK. “I was sideline reporter at Glasgow v Cheshire a couple of days after our win, so it was great to see Cheshire – a team we’d just beaten – go up against Glasgow, a team we’re about to play. “It was a good, close game, and went right down to the wire. Glasgow have just signed two more players as well, so that means they’ve got a really deep squad right now.